As a quality focused firm, we are engaged in offering a high quality range of Stone Ashok Stambh. 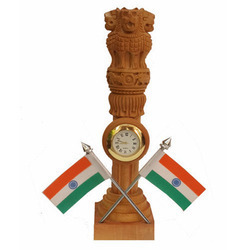 Wooden Ashoka Pillar Set for decorative purpose, at Home, Office Table & shop. Our clients can avail from us a mesmerizing range of wooden ashoka that is artistically created using superior quality material procured from renowned vendors. Available in various designs, shapes, patterns and sizes with attractive colors, these wooden ashoka are offered at most competitive prices. Wooden handmade ashoka pillar finely carved for attractive look and feel best for home decor and gifts to your dear ones. We are manufacturers & Suppliers of Handicrafts from Jaipur. We believe in providing good quality products at best opossible prices.We also deal in retail at www.craftsgallery.in. Different sizes of wooden Ashok Pillars are available with fine hand carving and finishing. With immense market knowledge, we have been able to provide optimum quality Sandalwood Ashoka Pillar. 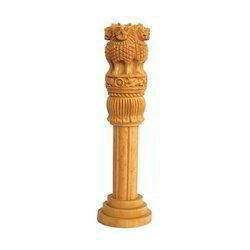 Ashoka pillar made by white wood, hand crefted by expert artisans. Best option for corporate gifting, bulk gifting. Available in 3", 4", 6", 8" and 12". The company has come up as a prominent Manufacturer, Exporter and Supplier of Wooden Ashoka Pillars in Howrah. The Wooden Ashoka Pillars, offered by the company, are known for their gorgeous designs and beautiful patterns. The elegant Wooden Ashoka Pillars are available at the best prices in various designs and sizes.